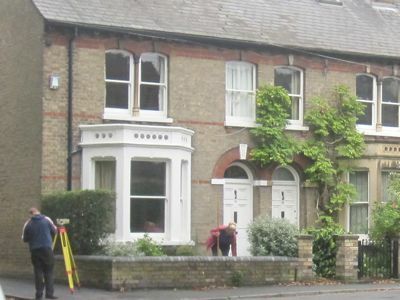 Surveyors Working at 13 Holland Street Cambridge on the 28th of September 2010. Cambridge City Council is proposing to fell, or destructively prune, up to five of the London plane trees in Alexandra Gardens which run along Carlyle Road. The council says it has been asked to do this work because the trees are causing structural damage to nearby buildings. A public meeting is to be held at St. Luke’s Church on the evening of the 15th of October, chaired by a ward councillor. The final decision on what to do will be taken by the executive councillor responsible, Cllr Cantrill. The council’s planning committee are going to advise Cllr Cantrill on what action to take, it appears they have twice deferred their consideration of the matter and are now expected to discuss it at their November meeting. Officers have stated Cllr Cantrill will make his decision at a meeting of the Community Services Scrutiny Committee; council officers have suggested a special meeting may be called for this purpose but if Cllr Cantrill waits for a currently scheduled meeting then the decision might not be made until next year. On the 1st of October I received a response to a freedom of information request I made for the correspondence in which the council was asked to fell or massively prune these trees. The entire request, correspondence and response can be viewed online as I made the request in public using the freedom of information website WhatDoTheyKnow.com. The initial correspondence with the council is reported to have been made in 2003. The earliest correspondence they have released is from 2005, it appears the council have lost or destroyed their copies of the initial exchanges. It appears a detailed report conducted by Peter Dann Limited Consulting Engineers, apparently acting for the council in May 2010, has not been released; only a covering letter appears to have been supplied. (I have followed this up with the council). Moisture level and soil structure analysis has been only carried out at one point in time, and not repeated to show any changes over time. A “control” hole, intended to show the state of the soil unaffected by trees, so that it can be compared with findings from holes dug next to parts of structures which are subsiding was located in the front garden of the affected property. This location is just a couple of metres from the test hole and not in an area clearly unaffected by trees. The main argument that the trees are causing subsidence appears to be the fact the movement in the property (6-8mm on the main house, 8-10mm in the garage and conservatory) is seasonal. The side of the house nearest the trees has been observed to drop in the summer of 2008 then recover back to its original level by the December of that year. The evidence provided does not show the degree to which moisture levels in the soil varies seasonally independently of the action of the trees. The lack of a control unaffected by vegetation means the effect of the trees cannot be seen. The control hole furthest away from the trees shows moisture levels essentially the same as those closest to the trees. The latest movement reports, for the period December 2008 -June 2009 show very little movement at all. There is no assessment of if the foundations of the various parts of the property are considered adequate; an important consideration when determining if the council owned trees are to be blamed for damage caused by the ground’s movement. The initial assumption made in a July 2004 report by Marishal Thompson was that the damage to the property is due to clay shrinkage subsidence attributable to vegetation. Either removing the trees, or keeping them is considered likely to cause further movement, and a claim could be made against the council in either case. The council’s request for its consulting engineers to advise on the relative costs involved has been left unanswered. No estimation of underpinning costs in either case have been provided. The insurers, householder and those representing them appear to be threatening to make a claim against the council in any eventuality, either on the basis the council didn’t act quickly enough to take action to manage the trees, or in the event the council decides to fell or retain the trees. The redaction applied was bizarre, in that the address of the affected property, 13 Holland Street, was blacked out when it appeared in writing, but plans, and photographs, clearly identifying the property have been released. The name of the property owner has also been redacted. Elements of the documents released are illegible; apparently not through redaction but through poor photocopying or scanning, perhaps of elements where colour was used in the originals. 13th January 2005 – Letter to Marishal Thompson and Co. from Diana Oviatt-Ham, Principal Arboricultural Officer, Cambridge City Council. This letter is responding to one dated 26th October 2004; it say that in that letter a request was made to the council to carry out works to the trees in Alexandra Gardens. no control trial pit, known not to be affected by vegetation. no level or distortion monitoring or report on these aspects. The council assures Marishal Thompson and Co. that thee trees will be managed in accordance with the Council’s Arboricultural Strategy. I note the council doesn’t appear to have a current arboricultural strategy any more, though had one in 2005. Notes damage to property is indicative of subsidence. Asks for confirmation the council owns the trees. Notes further investigations are ongoing and an arboriculturist’s recommendations are being sought. Notes “our intention to pursue a recovery of our principals and their insured’s financial outlay in regard to this matter”. 16th June 2008 – Letter from Diana Oviatt-Ham, Cambridge City Council to Mr Renyolds of Infront Innovation. Confirms the council is responsible for the management of the trees, and says they will be inspected in response to Infront Innovation’s letter and their current management regime considered. The council requests further details of the case implicating the trees in causing the structural damage. This investigation report is titled “Foundation Exploratory Hole Records”. There is a report on a hole dug next to the left – rear of the conservatory. A 70cm deep hole has been dug which exposed the edge of a 35cm thick concrete foundation extending 50cm from the wall. A 2mm diameter bore (“Auger hole”) was taken down to 3m. Vane shear testing has been conducted. This involves measuring the torsional force required to shear the soil core at various depths. The results show the clay getting stiffer as the depth increases. A similar report on the rear left corner of the house (report 2) shows the firm ground extending up to the base of the large hole (from the bottom of which the core was obtained), and something similar was found at the front left of the house (report 3). A hole described as “remote” at the right hand side of the front garden (report 4) showed similar results to those found at the left rear of the conservatory. The laboratory report is dated 29th January 2009 and is based on the samples taken in December 2008. The lack of a line in the table on p.13 for the test hole on rear left of the house is poor, as it means it isn’t explicitly clear no roots were found here and not the case either an omission has been made or a typo has occurred in repeating “TH3″ twice instead of listing TH1, TH2, TH3. However the lab report saying no roots were found in T2 (the test hole left rear of the house) is consistent with the observations of the on-site survey team who found no roots in this hole either. The lab report on the core taken from test hole 2 (p.16 of the PDF) also makes no notes of roots being found in that location. Given the lack of roots in hole T2, it is surprising it is the closest to the tree it is proposed to fell. Hole T2 is also closest to the damage zones marked on the plans so the lack of roots there appears significant. Rear Left of House: Moisture content increased from 19% at 0.89m to 31% at 2.75m. Heave potential 0-2cm. Front Left of House: Moisture content increased from 22% at 0.90m to 32% at 2.75m. I note the largest variation between soil strength and moisture content between the holes is towards the surface and not at depth. The moisture content at 3m depth is 31-32% in all holes, including the control. The moisture profile at the front left of the house nearest the trees, and front right of the house (control) appear almost identical. Much of this report is illegible due to the scanning quality. It shows the points at which the property was monitored, they include points on the main house, conservatory, original rear projection, extension, and garage. The assumption made is a point on the front of the house, furthest from the trees remains static, and the other point’s movement relative to that is recorded. The data appear to show some points on the house dropping by up to 1cm during the summer from June to October, and recovering to the original level by December. A further document (p.39 of the FOI release) includes what is presumably a June 2009 set of measurements (confusingly labelled 2008/5). Very little movement between Dec 2008 and June 2009 is shown, many points moving less than a tenth of the distance they did between October 2008 and December 2008. There is no data on the property’s movement since July 2009, this data, if available, may show if the crown reduction had an effect ie. if good management appears to be a route to addressing the problem. This report appears to be Infront Innovations representation, and commentary on the report by Geo-Serv consulting. The report includes a plan indicating that trial holes and bores were conducted in the pavement between the property and the trees. The claim summary here states that Crawford and Company were appointed to investigate the claim and following their investigations they concluded that subsidence had occurred die to root induced shrinkage of the clay sub-soil. (If the investigation referred to is the 19th July 2004 Marishal Thompson report than what they have pulled out is not that report’s findings but its initial assumptions – see below). It is reported that by Autumn 2006 cracks had recurred. Level monitoring was initiated in May 2008. Obtaining permission from the local authority to excavate the footpath delayed a site investigation until December 2008. Points 9,10 and 21 were those where downwards movement of over (but around) 1cm has been measured. Point 21 is on the left corner of the garage nearest the house; points 9 and 10 are on the corner of the conservatory furthest from the house. 25th February 2009 – Letter from Marishal Thompson and Co., Subsistance Mitigation Unit to Cambridge City Council. Asks the council to complete “vegation workes” recommended in their original arboricultrural report from 2005. Reports subsidence problems are continuing, further to correspondence from 2005. [Redundantly] states InFront Innovation have been appointed by the insurers to conduct an engineering investigation. Attached sheets to the letter from Marishal Thompson appear to be a copy of a 19th July 2004 report on the subsidence by Marishal Thompson acting as Arboricultural Consultancy for insurers Royal Sun Alliance. The report states Marishal Thompson’s client is “Crawford & Company” who are a claims adjustment and risk management company. The report appears to suggest Marishal Thompson follow a template response to this kind of situation where trees are suspected of causing subsistence. A copy of the list of actions, which includes “Appeal to Secretary of State” is included. A further attached sheet, which has a date and format suggesting it was attached to the 25th February 2009 letter from Marishal Thompson and Co. is headed “Arboricultural Consultancy for Royal Sun Alliance” and is part of the 19th July 2004 report admits in its first line that the report has “been produced without the benefit of site investigations” and starts with the assumption “Engineers are satisfied that current damage is due to clay shrinkage subsidence attributable to vegation”. It also states “Damage has been observed to the rear single-story extension”. It makes no mention of any damage to the main house. Not withstanding their location on the far side of the highway the London planes T1 and T2 have the theoretical potential to be influencing soil moisture content at depth to the flank of the property. This influence has not been confirmed by investigations to-date and with reference to their Local Authority ownership we recommend that further investigations should be considered. The London planes have not been subject to any significant management and we have been informed by the insured that a nearby property has been underpinned apparently due to the influence of these trees. We recommend that the Local Authority are requested to undertake necessary works to prevent further damage and our recommendations are outlined in Table 1. The table headings are illegible following scanning; it refers to three trees, T1 directly opposite Holland Street, T2 being the next tree up-hill towards Fisher Street, and T3 being the next tree in the direction of Fisher Street. It appears this could be an initial letter in relation to an independent report ordered by the council, or it could be another company acting for the householder or their insurers, this isn’t clear. Peter Dann Ltd. reviewed information supplied by the previous investigations, concur with their conclusions, and give three possible options. Remove the central tree and significantly reduce the trees either side. This is accompanied by warnings that heave may result and underpinning, the cost of which the insurers may still seek to recover from the council, may still be required. To retain the trees and accept a major underpinning scheme will be required. Peter Dann Limited anticipate the insurance company would recover the cost of this resolution from the council. To obtain independent arboricultural advice and attempt to agree with the insurance company to retain all trees but enter into a strict and regular tree management programme on all the trees to maintain their size to a level which maintains stability within the property. Any such management regime would need to be strictly adhered to and would not guarantee that there is no further movement but would reduce the risk of further movements as much as reasonably possible. We would expect that insurers would insist that the local authority would carry the risk of any further repair costs in the event of further movement occurring. However bearing in mind anecdotal evidence suggesting that the local authority were made aware of this initial claim in 2003 and that maintenance of the trees does not appear to have been carried out, we would anticipate that insurers are unlikely to accept this proposal. Claims the trees are under a tree preservation order. Gives the council 4 weeks to respond, states that if nothing is heard from the council by the 4th of June 2010 then underpinning works will be commenced. (The implication being a claim against the council for the cost of underpinning would then follow). This appears to be in response to a report which has not been disclosed. Informing Peter Dann Ltd. that the trees have been reduced by 30% in March 2009, so the council has not been non-responsive. Noting the movement is not to the main house, and querying if the foundations described in the report are for the main house or the extensions. Querying if the foundations in the subsiding parts of the property could be described as inadequate. Asking what would the likelihood of significant movement in the absence of vegetation be. Querying the lack of comment on the possible effect of the climbing plant. Asking about potential cost differences between underpinning to resist heave vs underpinning to resist further subsidence if the tree was retained. Questioning if the historic use of the Alexandria Gardens site as a brick works could have an influence on any structural and ground movement. Blaming the council for not telling them about the crown reduction works carried out. Suggesting the insurers might still see this as too little and too late. Also noting that this has not been sufficient to prevent movements of the property in the past year (no data on this has been released). Claims the movements recorded are “reasonably consistent along the length of the gable wall and side of the rear projection. States the adjoining property is also allegedly suffering movement. While the garage and conservatory are suffering marginally higher movement 9-10mm vs 6-8mm on the main house, the main house is still suffering from significant subsidence movements. The question relating to the possible impact of the previous use of the site as a brickworks is left unaddressed. The question of relative costs of underpinning to prevent heave following tree felling vs underpinning to prevent further effects of current ground movement is also left unaddressed. Why has Cllr Cantrill, and his officers, decided to take action now, and propose felling or destructively pruning the trees? What has materially changed recently? It appears that under Cllr Cantrill’s predecessors, the council was aware of the threat of a claim arising here, and that requests had been made to fell the tree, but they felt acting to reduce the crowns of the trees was a sufficient response. I think if a claim against the council is to be pursued in court they should defend it. I think this could be done cheaply – the council employs a team of tree officers who could seek to defend the interests of the city’s residents. There are key gaps in the insurer’s claims so far; they have not yet shown the trees to be the cause of the movement; they have not managed to disconnect the effect of seasonal variations in the clay from the effect of the trees. As for who should meet the costs involved – I think the answer is clearly the householder’s insurer; if they try and pass that responsibility off onto the council ie. to the residents of Cambridge that should be resisted. The main property, and conservatory, appear to have been built on a foundation of some sort; no expert assessment of if this is an adequate foundation has been made. The distances of the trees from the house has been measured unusually. The tree closest to the front left corner of the house is described as 16m away, the next 13m away, its not clear from which point measurements have been taken. No clear rationale is given for the recommended removal of the central tree and why that is considered the “primary cause”. As there are risks of further damage to the property, which could result in a claim against the council, both with doing nothing, and with tree felling or destructive pruning I think the best course of action is to try and agree on a long term maintenance plan for the trees. I think it should be up to the home owner or the insurer to show that what city residents, through the council, are currently doing, is unreasonable. If the council believes what it is doing is sufficient to remove prevent nuisance being caused to the property then it should be prepared to defend that stance. I think it is worth finding out from the County Council exactly why they have refused permission for a root barrier to be installed under the pavement; especially given their permission for the excavations as part of the investigations already carried out. I have made a Freedom of Information request seeking details. At Cambridge City Council’s North Area Committee on the 30th of September I asked if the council’s tree protocol applied in the North of the City and questioned why there were no longer notices on the Alexandra Gardens trees. Councillor Ian Nimmo-Smith, the meeting’s chair confirmed there were no longer notices on the trees, but observed they had most likely not been removed by the council. In response to questioning by Cllr Todd-Jones Cllr Nimmo-Smith reported it was his understanding that the council’s planning committee will not now discuss the trees until their meeting in November. Cllr Ward apologised on behalf of the council for the failings in the council’s consultation process to-date. Cllr Ward said there is no fresh consultation at the moment, but said he hoped the consultation would be run better the second time around. Cllr Ward said a public meeting was being organised for the 15th of October. It now appears that will be held at St. Luke’s Church. Cllr Blair undertook to find out what future consultation is planned. The covering letter which came with the documents released in response to my Freedom of Information request also confirmed the 15th of October public meeting which it said will be chaired by a ward councillor. It confirms this will be a public meeting and that respondents to the earlier consultation will be invited. On the question of releasing the information on which the council has based its position that the trees are causing structural damage Cllr Ward reported that the council’s lawyers were still considering which parts of the documents the council held were to be tippexed out before the release of the documents. This entry was tagged Arbury, North Area Committee, Rodrick Cantrill, Trees on October 4, 2010 by Richard Taylor. Which seems to contradict their ‘cut down all the trees rather than undertake expensive underpinning work’ stance. This latest release of information on the council’s website which Mr Lawton has linked to is astonishing. According to the newly released information at the above link; the council have run a new, extended consultation with a deadline of today. When I asked about any new consultation period at the North Area committee councillors were unaware of any new deadline. The documents released under the link titled “Engineers’ reports” are the same collection of documents released in response to my FOI request and summarised in the above article. i/ They do not hold a detailed report from Peter Dann Limited Consulting Engineers. ii/ The council lost a crate of documents containing the correspondence from 2003/4 which contains the initial request to the council to take action in respect of these trees. Just to let you know the bully boy technique of forcing councils to remove trees by threatening legal action is this “expert” teams standard approach. They did it with us. A 450 year old oak tree was cut down after they threatened to sue the council for underpinning costs. Unfortunately the council caved in and said the tree preservation order was eventually removed on health and safety grounds! If a proper and robust repair was undertaken in the first place then the trees would not need to be removed. I am writing in response to the invitation to the open meeting on the Alexandra Gardens trees to be held on Friday, 15 October at 7pm at St Luke’s Church in Victoria Road. 1. Can an explanation of the County Council’s reported refusal to give permission for a root barrier to be installed under the pavement be given? 2. Can city council officers explain how and when they came to their conclusions, published in their report to the September planning committee, that there was “proven link between the trees and the structural damage” (s.3.8). This was repeated in s7.2 which states: “The London plane trees have been identified as causing structural damage to a neighbouring property.” Do officers still stand by those claims? 3. Are assessments of the financial risk to the council in case of each of the various eventualities available and can they be presented? 4. Is any information available on how Cllr Cantrill is intending to make his decision? What is he taking into consideration? What relative weight is he giving to the minimisation of potential financial losses to the council compared to retaining the amenity value of the trees? Does Cllr Cantrill see the decision as boiling down to a financial equation in which a price/value is given to the trees? 5. Will the council publish the meeting papers, and minutes, online? Will the meeting be a formal council meeting and appear on the council’s online meeting diary with papers published in advance? 6. The potential for a claim against the council in respect of these trees has been known since 2003; why is the council now proposing to fell and/or destructively prune these trees? 7. Was the consultation prompted by Cllr Cantrill countenancing the felling of the trees? Did Cllr Cantrill make the decision to run the initial consultation or has the policy of his predecessor to require the pre-approval of all consultations on tree works on the city’s green spaces been revoked? 8. What records do the council have in relation to the plane tree removed apparently removed around a decade ago to at the south end of the row of trees in question? What happened in that instance? 9. What are the deadlines for objections / consultation responses in relation to the future elements of the decision making process. 10. Will the final decision be made in public?